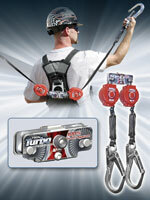 The Twin Turbo D-Ring Connector easily adapts two lightweight TurboLite Personal Fall Limiters for continuous tie-off fall protection. Its innovative design connects to the back D-ring of any fall protection harness and increases worker productivity and versatility due to freedom of movement. The connector is easy to use, assemble and disassemble. It meets all applicable OSHA, ANSI and CSA Z259.12-01 requirements.